Our extended families pretty much all live in different states than us so we do A LOT of traveling! My son had no good (or fun!) suitcase for his clothes and his stuff usually got thrown in with ours or in a duffel bag! I have always wanted to get him a fun little kid's suitcase so traveling would be fun for him and he could have his own bag! My son (and I!) are now very happy travelers because he recently got a super cute Thomas the Train suitcase from KimmyShop.com! KimmyShop.com has been a specialized children's character merchandise e-tailer since 2001. Started by a husband and wife team, KimmyShop.com has been recognized over the years as a premier destination for hard-to-find character merchandise featuring properties such as The Backyardigans, Caillou, Dora the Explorer, Disney Princess, Go Diego Go!, Toy Story, and many more. The Thomas the Train 1st Class Rolling Luggage Case can be taken with you wherever you go! This Thomas & Friends rolling luggage measures approximately 16.5 x 11 x 6 inches and is made of 600D polyester canvas material. The Thomas luggage case handle is retractable for easy handling. My son's eyes lit up the minute he saw this suitcase come in the mail! He absolutely LOVES Thomas right now and he also loves to have all his own "adult" items like a suitcase...so he can be just like Mommy and Daddy! I love that this suitcase rolls and has a retractable handle so both he and I can comfortable pull this suitcase, especially when flying! The suitcase has no separated storage areas inside or outside so all the clothes do get thrown in together but at his age, it isn't too big of a deal. But just be aware it isn't nicely organized on the inside. 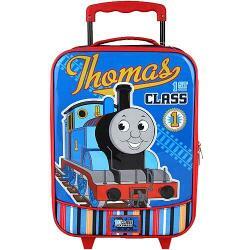 If your child is a huge fan of Thomas, like mine is, make sure to head over to KimmyShop.com and see all their awesome Thomas the Train toys and luggage! Their super cute suitcases are perfect for your children for any summer and family vacations you have planned this summer! Very cute!! It seems like your son was really enjoying it!